As magical and unforgettable as an elegant affair! 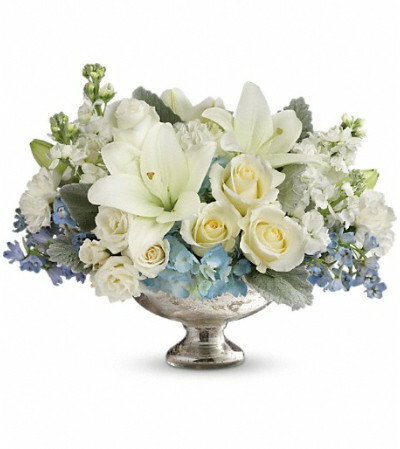 Creamy roses and snow white lilies are accented with whisper blue blooms in this regal arrangement, hand-delivered in a classic silver mercury glass bowl. An impressive, elegant choice no matter the occasion. 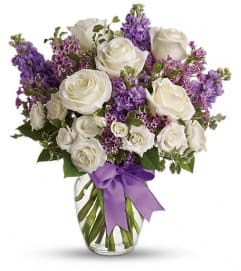 This elegant mix includes light blue hydrangea, white roses, white spray roses, white asiatic lilies, white carnations, light blue delphinium, white stock and dusty miller. 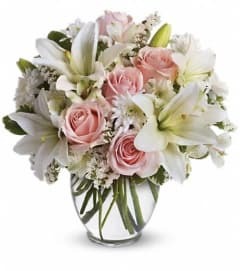 Delivered in a silver mercury glass bowl.